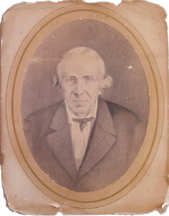 Daniel Miner Sr. was born in about 1776 -- the year of American independence and the Declaration of Independence -- the son of Western Pennsylvania pioneers Jacob and Maria (Nein) Minerd Sr. He and his brother Frederick both were pioneer settlers of Ohio. The photos of Daniel and his second wife, Margaret Fluckey seen here are the only known images of their generation of the family. At last count, Daniel and his wives together produced 17 children, 74 grandchildren and at least 106 great-grandchildren, virtually all born before the year 1900. These numbers surely will grow as additional research is done. While living in Western Pennsylvania, Daniel married Mary (?) (1779-1813) and began raising a large family. Her maiden name is unknown. It is possible that Daniel served in the Ohio militia during the War of 1812. 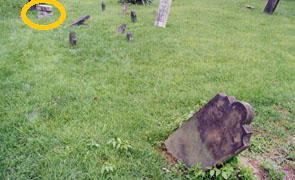 At one time, a War of 1812 marker was placed at his grave, though both the war and grave markers have since disappeared. Research into this question shows that a "Daniel Minard" served for one month and 13 days as a private with Darrow's Odd Battalion, 4th Brigade, 4th Division, of the Ohio Militia. Specific dates of the service were between Aug. 22, 1812 and Oct. 3, 1812, at which point the soldier was discharged. Whether or not the soldier is our Daniel is not yet proven, but likely. In 1812, Daniel and Frederick left Pennsylvania and jointly bought land in Sego, Perry County, OH. (The deed, granted by the federal government, and made out in both of their names, bears the signature of President James Madison.) They also bought two separate farms, one for each brother. Daniel would sell his farm within a few years, but Frederick lived on his for the rest of his long life. 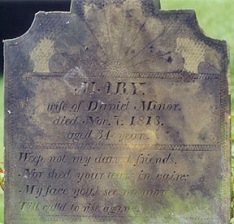 Tragically, Mary died a year after they settled in Ohio -- on Nov. 7, 1813, at the age of 34 -- perhaps in childbirth. The precise cause of death may never be known. She is buried at the Hopewell Church Cemetery near Sego. Till call'd to rise again. 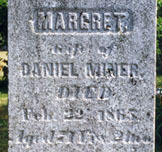 After Mary's death, Daniel was left to raise six motherless children -- Rebecca Danison, Jacob Miner, Sarah Ferguson, Solomon Miner, Francis Miner and Daniel Minor Jr. There's a possibility that Daniel and Mary had another daughter Mary, who married James Burgoin, but that connection is not yet proven. On Oct. 12, 1814, in Muskingum County, OH, the 38-year-old Daniel married 21-year-old Margaret "Peggy" Fluckey (1793-1865), the daughter of George and Margaret (Stotz) Fluckey. The wedding was performed by Elder James Quin, and is recorded today in marriage lists of the county. There was a 17-year age difference between groom and bride. They had 10 more children of their own -- Mary Sellers, Sarah Miner, George S. Miner, Mahala White, Elizabeth "Libby" Wilson Armstrong, Margaret Sloan Maxwell, Capt. Henry Clay Minor, Eli B. Miner and Lydia Ann Brown. 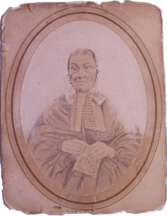 In about 1812 or 1813, Daniel and Peggy were members of "The Hopewell Class," which "was organized to meet at Abram Hamisfar's (now Rusk's), of which Robert Chalfant was leader," said the History of Fairfield & Perry Counties. Daniel's children Jacob, Rebecca and Francis were also members of this class. After 20 years of marriage, in 1835, Daniel and Peggy moved to near Cardington, Morrow County, OH, where her parents lived, and where later she would inherit farmland. While the precise reason for the move is not known, it is likely that Daniel had an opportunity to obtain inexpensive farmland. The Miners resided in Cardington for the rest of their lives. Over the years, Daniel borrowed sums of money from brother in law Adam Fluckey and sister in law Elizabeth (Fluckey) Taylor. Papers show he could not write his own name, because when he signed documents, he did so with an "X." Daniel was ill during most of 1854. Records show that from April to September that year, he was continually purchasing medicine and "syrup iodide." His sufferings ended when he passed away on Oct. 8, 1854. His coffin cost $11.50 to build and deliver, and the hearse service charged $2 for "two trips." For the funeral, his wife purchased a bonnet, 1 1/2 yards of black ribbon, 1 1/4 yards of black crape, a black shawl, three pair of red gloves and a yard of "Book Muslin" from a local store. Aged 77 years, 8 mos. & 25 days. She also was allowed to keep 400 lbs fork, one cow, 28 bushels corn, corn fodder, one bureau, one clock, one pair and irons, two old chairs, two barrels, one chest and one fanning mill. Peggy lived for another 11 years, and died on Feb. 22, 1865. She was buried beside her husband at the Bethel Cemetery near Cardington, and has a separate marker. Several adult grandchildren visiting from Kansas paid their respects at the graves in 1930. However, by the 1970s, Daniel's grave marker was crumbling. Marvin Hack, a cemetery trustee, viewed it in the summer of 1972 and reported that it was "of the old slate type and [has] weathered very badly." A great-great-grandson saw it in the summer of 1974. But as of 1996, when visited by the founder of this website, it was gone, and its whereabouts are unknown, while Peggy's is still intact and legible. All told, Daniel had 17 children and at least 74 grandchildren. His great-granddaughter, Jeanette "Blanche" (Clark) Tarter, worked for years to establish a base of knowledge of this branch, and she co-published a book in 1971. In 1996, Blanche's son graciously donated a copy of her book and her extensive collection of papers to what became the Minerd.com Archives. In looking through an old family photo album in the early 1970s, Blanche commented on Daniel's appearance in his only known photograph portrait: "Daniel looks like such a kind benevolent old man." Minerd.com extends its gratitude to Suzanne Schroeder Enlow, a descendant of Margaret (Fluckey) Miner's brother, Adam Fluckey, for sharing material for this biography. In 2005, a 740-page book, George Fluckey the Hessian Soldier, was published by authors Lois Catlett and Sharon (Catlett) Kossieck. It contains extensive excerpts of Minerd.com biographies of Daniel and Peggy Miner and their descendants. Minerd.com is credited as the source throughout the volume, and a copy was graciously donated by the authors to the Minerd.com Archives.